Pro­duced in col­lab­o­ra­tion with the Pres­by­ter­ian AIDS Net­work, and build­ing on a ground-breaking con­fer­ence at John­ston C. Smith The­o­log­i­cal Sem­i­nary, Unbound explores prophetic wit­ness and com­pas­sion­ate action in response to HIV and AIDS. 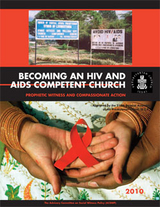 World AIDS Day Sermon: "Encounter"
Bulletin Insert 1: "10 Things Your Church Can Do"
Bulletin Insert 2: "Global Pandemic"
Bulletin Insert 3: "Called to Respond"
WAD Sermon: "What Would Jonah Do?" "Children's Ministry Lesson:	Jesus Cleanses a Leper"
"Living out our Shared Responsibility: A New Model of Care"
"Raising Awarness at Your Seminary or College"